Wisconsin is one of the coldest States in US. The average temperature varies during winter months from 39°F to below freezing point(sometimes). My friend who has been here for 10 years described it as a frozen tundra, lol. Wisconsin is the home state of the love of my life, my husband Teban(Steve). With my children, this is now our home for 3 years but second only to our beloved country Philippines. This recipe was created due to homesickness of the warm tropical weather we have enjoyed since childhood. This soup makes us feel like we are home in my nanay's(mom's) kitchen. Boil the water in a cooking pot on the stove. When water has boiled, add the noodles and the spices that came with it. Mix and let it boil for 1 minute. Add the carrots, cabbage, and eggs. Sprinkle with black pepper, cumin, parsley and mix. Let it boil for another minute. Add salt only if it's not salty enough. Good for 2-3 servings. Very nice, i like how you improvised the simple soup to a healthier one. I always add veggies to instant noodles as well to make it more healthier. Whoa.. now this is good. I'd love to try this sometime. 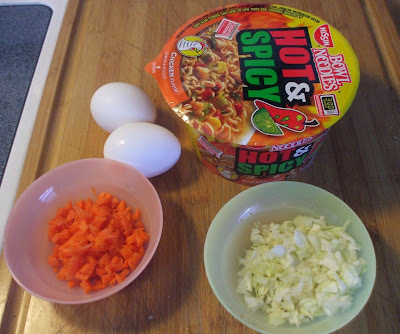 This is a better alternative for instant noodles. Napa cabbage ang madalas ko gamitin with this kasi mas type ni hubby yung Napa. Hmmmm... yummy! I love this way of cooking the instant noodles. I like to add veggies with mine too because it turns into one plain noodles to delicious. It is perfect for the freezing cold weather. It is cold here too and snowing right now. Stay warm and safe!